“Don’t drink and drive.” That phrase has been repeated countless times from concerned friends and family, and even from the television. While drunk driving is extremely dangerous and causes many automobile accidents resulting in injuries and death, unfortunately, it is not the only significant way in which accidents are caused. Another major cause of automobile accidents is distracted driving, namely using a smartphone while operating a car. AAA’s Foundation for Traffic Safety has recently put out some numbers related to distracted driving. The main cause of distraction is mobile phones. According to the study, 80 percent of drivers think about something besides driving as they are driving. In other words, their focus is not on the road. Sixteen percent of all fatal crashes are a result of distracted driving. Another interesting aspect to this study is that even after you put down your phone, your focus and attention still is not on the road for another 27 seconds. In 2013, Florida enacted a ban on texting while driving. This ban, however, does not extend to all cell phone use. The law states that you may not operate a car (or other motorized vehicle) while typing numbers, letters, or symbols as a way to communicate interpersonally and non-vocally. 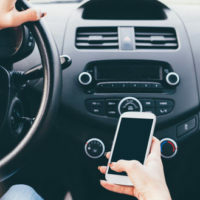 This law, while banning texting, does not extend to other mobile uses though, such as punching in an address for navigation or searching for a song. Another interesting aspect to this law is that you cannot be pulled over by a police officer solely for texting and driving. This law is referred to as a “secondary law” and therefore can only be enforced if you have also been pulled over for another traffic violation, i.e. running a stop sign. On the other hand, talking on your phone without a wireless headset is still legal in Florida. Many other states have enacted laws banning hand-held communication while driving, making drivers opt for wireless talk options. Florida still has not enacted this law, enabling a significant amount of distracted drivers. This is much easier said than done, but phones should be kept away from the driver while they are operating a motor vehicle. Many of us have used our phones as we have driven, but that practice must be stopped. More and more people get hurt as the result of distracted driving. Although it may be difficult, remember it is worthwhile to stop using your phone as you drive in order to possibly save a life. If you or a loved one has recently been involved in an auto accident, contact the experienced attorneys at Spencer Morgan Law at 866-667-4265 for a consultation on your case. Our attorneys are highly experienced when it comes to automobile accidents and helping you and your family receive the justice that you deserve.